Last Sunday while most people were busy watching the Oscars, a lucky few of us got to hear two polished string quartets in the perfect and intimate acoustics of Kohl Mansion, just south of the SF Airport in Burlingame. The Henschel Quartett is a formidable and prize-winning group (and yes, that is the German spelling of “quartet”), and they anchored a diverse program. And more importantly for some, the three men wore black with red ties and their violist wore a low-cut black dress with a lovely patterned shawl, classy enough for the pre-Oscars red carpet. The other string quartet was the Telegraph Quartet, a young San Francisco-based group that is in the midst of a meteoric rise towards career and fame. The two groups came together after intermission on a stage that was enlarged to accommodate the eight musicians, performing Felix Mendelssohn’s Octet in E-flat Major. Music at Kohl Mansion Executive Director Patrica Kristof Moy welcomed us and thanked the sold-out room for choosing music over Hollywood, then turned us over to the “quartett” from Munich. They opened with a fresh and difficult piece, Jesper Koch’s Quartet No. 3, and this was the West Coast Premiere. Cellist Mathias Beyer-Karlshoj began with bottom notes full of rust and unrefined ore and one by one the others joined to build a framework of almost-random gestures. One could find the soft cracking of ice and the mumble of conversations overheard, and there were tender spots and barnyard fiddlings and tragic atonal passages. The three movements each ended with an abrupt togetherness, as if that would erase all of the bickering and urban angst. “It looked really fun to play,” opined the retired teacher seated next to me. Then they were joined by double-bass player Scott Pingel for a summery string quintet by Dvorak, and that was as forgiving and friendly and familial as the last was icy and earnest. Violinist Christoph Henschel was understated in his fast passages, choosing taut weaves over the shine of a soloist, and violist Monika Henschel (his sister) embodied a regal and compassionate center. Indeed, one was reminded that Dvorak was also a violist. While this was one of Dvorak’s earliest works, it already showed his early love of folk themes, and the additional bass gave it the breadth of an orchestra. And then a fine frolic, as the Telegraph Quartet joined! The Great Hall of Kohl Mansion is a tall two stories, with a balcony where students of the resident school, Mercy High School, can lean on a railing and listen to the World class groups below, and those programs are usually sold out (as was Sunday’s). But despite that lofted mixing chamber the sound is direct and lively, with the audience on three sides of the stage close enough for some to read the music over the musicians’ shoulders. I don’t think I have ever heard eight performers here but the sound was so immediate that the individuals were each distinct while the sudden chords were so lush and powerful one could have specified seat belts. Indeed, this was that full sound where the eye is necessary in directing the ear: as I watched violist Monika Henschel fiercely bow, her line as a rich thread in that mix suddenly came to life inside my “ear.” The viola is usually an inner line, layering the music and building harmonies, and is often lost as a distinct persona. And this is why live performance is so superior to a recording, and why you, our reader, would be better off going to a live event than listening to a recording. Then you might also see a sweaty hand slip up the neck and wonder if a musician was about to drop a priceless violin. Or watch musicians frown and whisper and then nod together and play a divine chord, or inch backwards to the edge of the dais while the front row audience edged back in case they tipped over. Now, these were all pros and nothing marred the work. But there was another layer that could not be heard, the supple play of emotions. Violinist Catalin Desaga clenched his lips and drew his eyebrows into sorrow as he performed lines that joined the parts into a whole, and first violinist Christoph Henschel swayed so actively that he rarely had his weight on both legs (and he used an extra wide bench and once nearly lost his balance). And violist Pei-Ling Lin drew her eyebrows down into smoldering concentration while cellist Jeremiah Shaw snapped his eyes and slashed his bow as if it were a killing stroke. Wow! And beyond the deep expression of the individual was another level, an edgy game of competition, with the four younger performers showing their fire and spit and the older musicians channeling that into the needs of the music. Mendelssohn was barely 17 years old when he wrote his Octet, a rippling and muscular work of shocking maturity. Here was virtuosic violin writing and Christoph Henschel was absolutely blistering here (and the young composer was a gifted violinist). And the first movement motif was lively and lovely, and melodic beauty was one of the hallmarks of this great composer. And Mendelssohn already had a robust appreciation for inner lines – and even as a youngster he waited for each of Beethoven’s late quartets and shared his love of Bach’s nearly forgotten explorations into fugue. In fact, the only thing that makes this a distinctly young work was the experimental edge that was in Mendelssohn’s gestures, and that was echoed in this performance. The seating enhanced this with paired first violins, paired seconds, the two violas and then both cellos, and it was Henschel, Telegraph, Henschel, Telegraph, etc. so that each looked to their own foursome for timing and clues, as one must in a quartet, but were seated next to their counterparts. In their quick looks we could see the multiple lines of communication. Perhaps such fine musicianship and deep communication is what allowed a nicely competitive edge, each pair vying while supporting and mirroring the experimental nature of the young composer. And, of course, that contradictory impulse is a basic quality of successful quartets, a fine balancing of ego and attention, of wanting to shine and helping others to be sublime. Not unlike the Oscars, one could say. 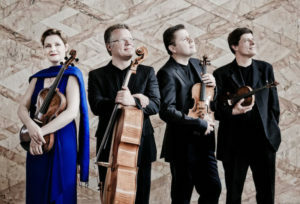 Photo, top of the Henschel Quartett; from left, Monika Henschel, Mathias Beyer-Karlshøj, Catalin Desaga and Christoph Henschel; photo by Marco Borggreve. 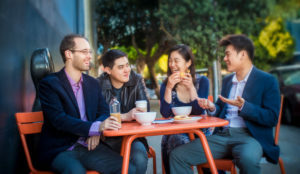 Below, the Telegraph Quartet, from left, Joseph Maile, Jeremiah Shaw, Pei-Ling Lin and Eric Chin; photo by Carlin Ma.